Burdock the cat isn't sure how he feels about the other barn animals. After all, they seem like a family, and he is just the stray who was dumped on their doorstep. One day, though, Burdock hears the brothers who own the farm having an argument, during which one of them suggests burning the barn to the ground! Knowing what could happen to Nanny the goat, Mrs. Brown the cow, and the other barn animals in a fire, Burdock decides to stick around and do what he can to help them escape. This animal story is a straightforward tale about a struggle between good and evil, and the importance of friendship and teamwork in overcoming seemingly insurmountable odds. Though the animals do some things that are probably impossible for real animals to accomplish, the story is still believable because it has these very human issues and emotions at its heart. Though the main characters are all animals, each one is recognizable in some way because of his or her emotional depth and unique voice. There is Nanny, the motherly goat, Mrs. Brown the elderly cow who wishes not to be a burden, Burdock, the one-eyed cat who just wants a place to belong, Fluff the sheep, whose determination is outweighed only by her loyalty and Figgy the Piggy, whose logical thinking leads readers to see pigs as more than lazy slobs who roll about in the mud. Each animal adds something to the escape plan, and to the family dynamic in the barn. Humans are a part of this world, as well. There are mentions of minor characters - local business owners, the town librarian, a family of newcomers - all of whom contribute to the reader's sense of the community as a whole, and of the world into which the animals will venture if their escape plan is a success. The fact that the animals do not exist in a vacuum gives the story greater dimensions, and these occasional glimpses into the lives of humans prepare the reader for a most satisfying conclusion to the story. Another fun element of this book that will get a good laugh from adult readers is the inclusion of certain songs that the animals sing. Mrs. Brown sings both "That's Amore" and "Don't Fence Me In" each using a clever set of animal-focused lyrics. Even kids who don't know the tunes (which is likely to be most kids in the target age group) will enjoy the lyrics, and adults who sing while reading the book aloud - or even during a booktalk - will absolutely encourage kids to read this book. While it would be impossible to surpass a beloved classic, this book does share common themes and a common setting with Charlotte's Web. It seems foolish to compare a brand-new book to a true classic, but both stories will certainly appeal to a similar audience. 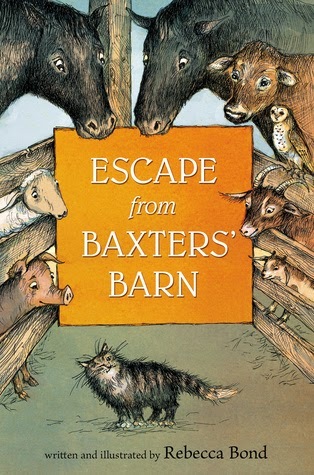 Other read-alikes for Escape from Baxters' Barn which also feature talking animals include The Trouble with Chickens by Doreen Cronin, the Bunnicula series by James Howe, and The Cricket in Times Square by George Selden. It would also be interesting to pair with another new novel set on a farm, Unusual Chickens for the Exceptional Poultry Farmer by Kelly Jones. I'm not usually one for animal stories, but this sounds unique and I loved Charlotte's Web. The animals' singing sounds like a lot of fun! You've got to love that cover. I'm not a big fan of anthropomorphized animals, but you make this sound pretty good. Maybe I'll check it out. Thanks for the post.